Soon, the Christmas season will come. One of the highlights of Christmas is illumination, I think. Tokyo has a lot of beautiful Christmas Light spots. You will enjoy the wonderful and elaborated Christmas Lights. Now, let me show you some recommended Christmas Lights in Tokyo today. Let’s check it out ! The streets of Roppongi is lit by the cold and warm colored lights and that tells Roppongi about the arrival of winter . This illumination is full of highlights. 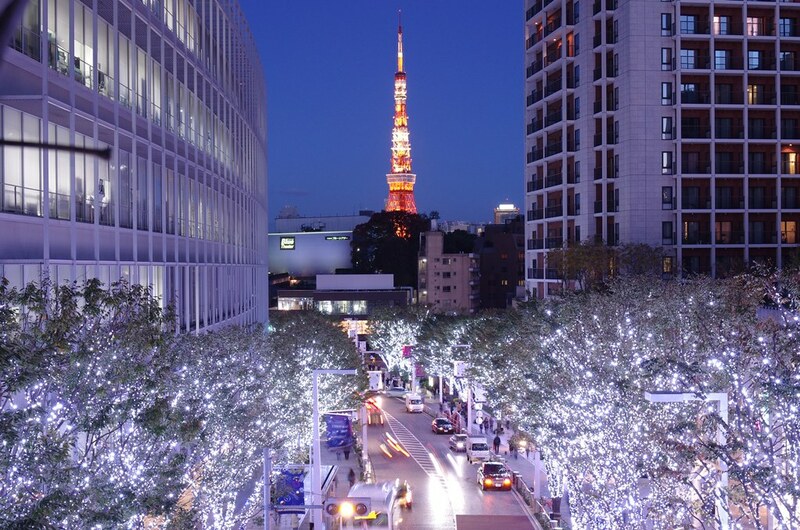 About 400 meters row of trees illuminate the street of Roppongi and create a fantastic space. That’s a must-see. Approximately 270 thousand balls of LED light are shed in fantastic blue. It is said that more than 500 thousand of people have visited in the past. We can expect a wonderful Christmas Lights this year, too. It’s a very exciting event when you go with a lover, so we recommend you for a date. The light show is held every day during lighting up session. Marunouchi Illumination was accredited as “ Japan Night View Heritage “ in 2016 fiscal year. Approximately 250 street trees shine with about 1.03 million balls of champagne gold colored LED light. Of course it’s recommended even for one person ! A Very popular Christamas event, “ Aonodoukutsu “ was held along the Meguro river in 2014. But it was cancelled in 2015 due to the terrible crowd of people. Fortunately, it was decided to revive in Shibuya this year. There is no doubt that it will be a new Shibuya winter scenic view. Let’s go to Shibuya this year ! The highlight of Midtown Christmas 2016 is ” Vision Dome ” and ” Starry Sky Illumination ” using about 520 thousand LEDs. These Christmas lights express the outer space in a vast open space, and the production of dynamic lights is done. Tokyo Midtown is colored with various illuminations. Some tours also guide in English and Chinese, so it’s also recommended for overseas tourists. Christmas lights of Yebisu Garden Place is so popular enough to enter within fifth place in Christmas lights rankings of Tokyo. The world’s largest baccarat chandelier is also one of the highlight of this event. The area around Yebisu Garden Place is illuminated with about 100 thousand balls of gentle light. You can also enjoy luxurious and powerful Christmas trees. Don’t miss it ! 40 trees lining up to 200 meters, a tree about 20 meters high, and illumination of 220 thousand balls of Christmas light are coloring the night of Odaiba. This illumination can not be seen in other places, so it’s recommended for families, couples, and even for those who usually don’t go to see a lighting up so much. 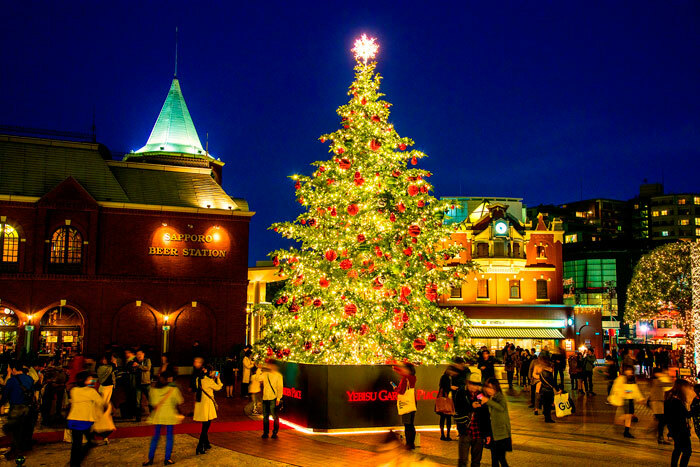 Christmas Lights of Omotesando is the one coloring lines of gingko trees in champagne gold and becomes a topic every year. Especially before Christmas, it will be crowded like a crowded train. We recommend you for a date, too ! Some Christmas Light event has already begun. It wiil be more romantic if it snows on Christmas. There are so many recommended Christmas Light spots in Tokyo, please drop in once with your family, your precious person, and friends or colleagues. Of course even one person is nice !